Los Angeles, America’s pop culture capital. It was a long day from Belize to Los Angeles, California. A 4:30am start, three taxis, a boat and two flights later we were in LA. We were staying right on the boardwalk in Venice Beach, a good choice considering it was only 20 minutes from LAX. We hadn’t had much exercise over the last week in San Pedro, so we made up for it with a 23km walk around Venice Beach and Santa Monica. LA is a city built for the automobile and everything is miles apart. People talk about just a few minutes to get from place to place – this is by car of course. Our long walk down to Santa Monica culminated with a short stroll along the famous pier. Built in 1909 it is one of the main attractions of this seaside town. There is even a parking lot on the pier – another acknowledgement to the dominance of the auto. The pier is home to a solar powered Ferris wheel, aquarium and a 1920s’ carousel. It’s similar to the pier at Brighton, England, but no where near as long and without the charm of the British seaside resort. Santa Monica had a couple of very big differences. The first is the long sandy beach, which stretches north and south for kilometers. Then there’s the surf, which again runs the entire length of the beach, and is very consistent. Pale blue life saving huts are situated every 200 meters or so along the beach, conjuring up images of Bay Watch and the well augmented Pamela Anderson. ‘June Gloom’ is how the weather is described at this time of the year. The days start out chilly, with heavy cloud cover, but clear to a bright blue sky by the afternoon. Los Angeles is a big city, so their Hop-On-Hop-Off bus is a great way to see a lot, and learn a lot about its history. There are five major routes in the StarLine Tour agenda. We managed to fit in three of them over a twenty four hour period. The first was the Yellow Route, through Santa Monica and Beverly Hills. We then transferred to the Red Route which took us into the heart of Hollywood, along Melrose Avenue and then down Sunset Street. The next day we took the Blue Route from Santa Monica to Venice Beach and down to Marina Del Ray. I sat up on the top deck of the bus, with a permanent grin on my face. This was the stuff of dreams. These places are part of our pop culture and many of the locations were immortalised in TV shows from the 50s and 60s. Seventy Seven Sunset Strip and The Beverley Hillbillies spring to mind. 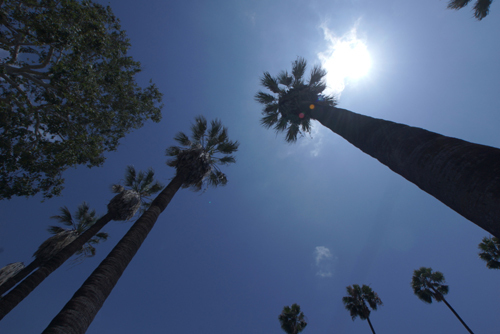 Apart from movies and TV, Los Angeles has been home to other Twentieth Century phenomena’s. The surf culture and surf music of the 60s, as well as the rise of skateboarding and extreme sports in the 70s, all started in the LA area. All this nostalgia was heightened by the excellent on-board commentary, done by a voice over with a very English accent. He seemed to add humor and whimsy to the trip. Then there’s the actually history of LA. Venice and Venice Beach was founded, as a seaside resort, in 1906 by the tobacco millionaire Abbot Kinney and originally called Venice America. The canals were designed to drain the area, which was marshland. Unfortunately they weren’t deep enough and soon started to silt up. There is now only a small number of the canals remaining, but these are where the prime properties are to be found in Venice. Venice and in particular the Venice boardwalk, which isn’t actually a boardwalk but a long strip of asphalt, is home to to a variety of street people, performers, hawkers and a constant stream of tourists. It’s like a 4.2km long circus stage. Large murals are a part of the Venice landscape. There was one on the side wall of our hotel and many others along the Venice boardwalk. In South Venice, just near the canals, there’s even a three story high portrait of Mr Kinney. On Sunday afternoon we visited the Getty Centre. This is high up on a hill with tremendous views of LA. It was opened in 1997 at a cost of $1.3 billion and you can certainly see where the money has gone. The buildings are all marble with the landscaping complementing the cliff top location. There is even a hovertrain to transport the visitor to the museum complex. We decided to try the LA public transport system. Probably not one of our smartest moves as this is a city designed for driving. An hour and a half later we reached our the Getty Centre, with really only enough time to explore the gardens. There was excellent sculptures, one by Henry Moore and another by René Magritte. Just down the boardwalk from our hotel was the Venice Ale House, with 30 draught beers on offer. Here we met a tree. This guy was on stilts, dressed as a tree and came into the Venice Ale House for a coconut juice. What else does a tree do. As we have seen from Paris to Panama the craft beer scene is everywhere. There were at least four other such pubs in the Venice and Santa Monica area. IPA or India Pale Ale seems to be one of the styles most prevalent. Everywhere we have been I have found at least three or four on offer. Having got a real taste for LA and the surrounding areas, on the Hop-On Hop-off bus, we felt it needed a more in-depth investigation. So we hired a car. This time a VW Jetta, which was a class above what we had been driving in Central America. Our first stop was Malibu and Zuma Beach, which is north of LA. Ever since we arrived there has always been the June Gloom, with dark foreboding clouds hanging over us every morning. Now there was a fog. The summer holidays have started so there were families, university students and large groups of teenagers on camp holidays. They looked a little out of place on this Malibu beach surrounded by fog. From there we went in search of houses, not just any houses but those that were designed by the American icon and architect, Frank Lloyd Wright (1867-19590). The two we did find, that were unfortunately closed, were Ennis House and Hollyhock House. These are built in, what has been termed, a ‘Mayan Revival’ style. Frank Lloyd Wright was not only an architect but an interior designer and a leader of the Prairie School. He designed everything from skyscrapers to schools but he is best known for his private houses. Many of these were built for the wealthy new rich who were the patrons of the Arts and Crafts movement that had been developed in the United Kingdom. Wright was a complete designer in that he considered all elements of the building. He designed the tiles, windows, wallpaper and even the furniture. His driving philosophy was nature and many of his works express this. Hollyhock house was built using prefabricated concrete blocks with styalised hollyhock motifs decorating the structure. Many similarities can be drawn between Wright’s approach and that of the famous Catalan architect Antonio Gaudi. With both architects, nature was their inspiration. We then drove up to Mount Hollywood to visit the Griffith Observatory again it was closed. Opened in 1935, it has been the set for dozens of Hollywood’s movies. ‘Rebel Without a Cause’ is one of the most famous. Los Angeles is more like a large Hollywood set than a city. At the base of Mount Hollywood is the Greek Theatre. Again this location conjured up memories of Neil Diamond’s Hot August Night, that was recorded there in 1972. From the observatory we had a great view of the Hollywood sign, which has become an cultural icon of the city. It was originally erected in 1923 to advertise real estate and read ‘Hollywoodland’. Late in the afternoon we drove around the streets of Beverly Hills or ‘90210’ This was developed in 1914 by a group of investors who were looking for oil but only found water. The next day, after dropping off the car, we again attempted to tame the LA public transport system. I can see why most people drive. It takes forever to get anywhere and the buses we travelled on seem to be frequented by LA’s more colourful characters. No wonder we got strange looks from anyone we told we were using ‘The Metro’. Our primary destination was the Los Angeles County Museum of Art or LACMA on Wilshire Boulevard. Established at its current location in 1965 it holds more than 120,000 works covering the history of art. We concentrated on two of the temporary exhibitions. The first was by Noah Purifoy (1917-2004) titled ‘Junk Data’ Noah was a black American Assemblage Sculptor of found objects. He was very active in using his art to draw attention to the problems of homelessness amongst black communities. In complete contrast we then visited an exhibition by Larry Sultan (1946-2009) a white middle class urban photographer. His photography was all about ambiguity and featured many locations in the LA suburbs. Later in his career he collaborated with Mike Mandel, to develop work that poked fun at LA advertising, especially billboards, of the 70s and 80s. 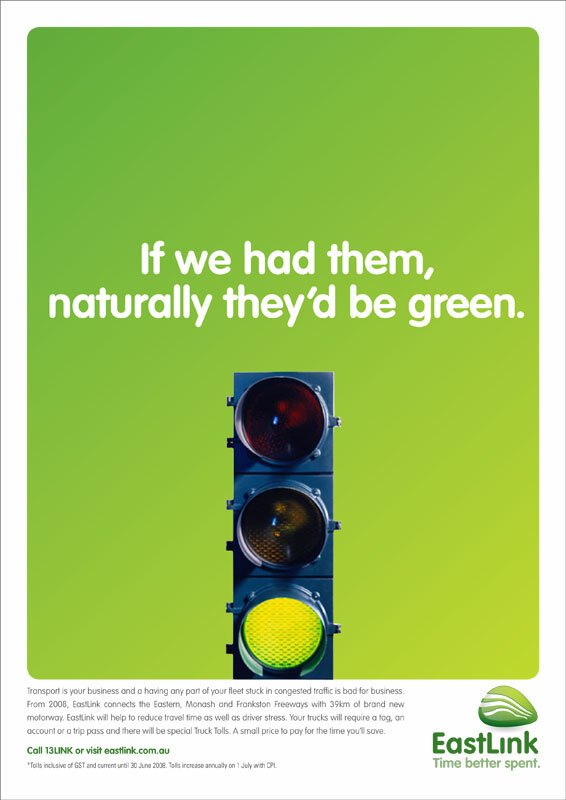 These posters look like real ads but said nothing. A lot like much of today’s advertising. It was then back on the bus for the long ride back to Santa Monica and Venice Beach. Belize – English, in a very North American way. We have mainly been in Spanish speaking countries since last December, so it was strange to suddenly find ourselves speaking English again. Belize is the youngest Caribbean nation, getting independence in 1981. Formally British Honduras, Belize has been the home to the English since a shipwreck in 1638. It was formally made a Crown Colony in 1862. In Pre-Columbian times it was part of the Mayan Empire. We took a flight from Flores, Guatemala to Belize City in a Cessna Caravan. This is the smallest international aircraft that I have ever flown in. We have since discovered that the Caravan is also one of the safest. Our taxi driver from the airport was curious as to why were were staying, even one night, in Belize City and not going straight to San Pedro. Once we reached the city we understood why. Then we met Prince Charles Perez, a raconteur, orator and mango salesman. 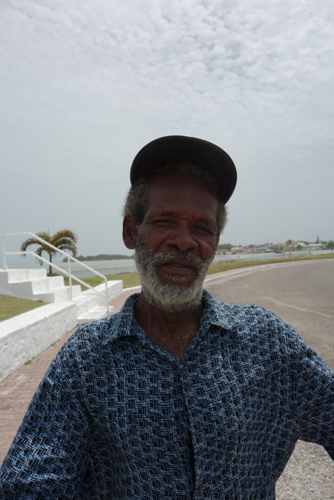 He kept us, and a couple from Jamaica, amused for half an hour with the origin of the name Belize. In short it means ‘Beautiful Country’. We spent a few hours wandering around the streets of Belize. This is about as much time as you need to see the main sights. It was a Sunday and the place was deserted. It reminded me very much of a Nuku’alofa, the capital of Tonga – Belize City is slightly larger. The only real activity was centered around St. John the Baptist Cathedral, where a group of teenagers, dressed in immaculate uniforms, were attending a service. The cathedral, first constructed in 1812, is one of the oldest buildings in the city. Our hotel was originally an old colonial timber mansion, right on the waterfront and like most of Belize City, it had seen better days. However the staff were very friendly and the room was comfortable. As we have discovered in other coastal areas of the Caribbean, the breeze is constantly blowing. This keeps the humidity down, the bugs away and makes the evenings very pleasant. The hub of activity in Belize City is the water taxi terminal, which indicates that most people are just passing through. Maybe the taxi driver was right. Prince Charles Perez turned out to be the highlight of Belize City. The water taxi ride from Belize City to San Pedro, on Ambergris Caye, was an hour and a half of bumps and bounces. We selected San Pedro as a spot to plan our assault on the US. It was also to have a break. It had been 97 days on the road since we left Barcelona and our clothes needed a good wash and our packs needed airing. Isla Bonita Yacht Club was our home for the next ten days. The only yachts we saw were those that sailed past. We did find out later that it had actually been a marina but that had long since vanished. The hotel was named after the 1987 hit by Madonna ‘La Isla Bonita’ or Beautiful Island, which was originally written as a lament of San Pedro. Like most things in the tropics, if they aren’t maintained, they very quickly return to ‘nature’. The Isla Bonita Yacht Club was perfect for our needs, it had a pool, self catering and a BBQ, right outside our bungalow. There was also a fruit shop, supermarket and bottle shop, just out side. Always in search of a good coffee, we discovered the Island Buzz Cafe. They served Guatemalan, free trade coffee, that was roasted locally. As with a lot of tourist related businesses in Belize, the Island Buzz Cafe is run by expat Americans. It’s easy to see why escaping the cold of a North American winter is a very attractive option. The next day we had yet another coffee at the Island Buzz Cafe and this time we got chatting to a Canadian, another escapee from the north. He was an interesting guy who had a liking for photography. He had recently bought a GoPro and was espousing it’s features. This small, high resolution, waterproof and extremely tough action camera can be placed on a ‘selfie stick’ and thrust into all sorts of weird situations. Seeing the world with another perspective, or point of view, is the art of good photography. Golf carts are the preferred mode of transport in San Pedro. There’s barely a car in sight. Whenever you see a cart parked, they always have a steering lock. I questioned the Canadian about the obvious crime rate on Ambergris Caye. He explained that, because most carts look similar and one cart key fits all, locking them prevents drunk tourists and residents driving away from a bar in the wrong cart. We hired a cart for a day – it was too long. From where we were, on Coconut Drive, we could only travel 8km north and 4.4km south. The guy I rented the cart from had a different story about the tight security on the carts. He said there is a black market in cart parts and the carts are regularly stolen, wrecked and their parts sold. Apart from the gated communities, designed for the tourists and North American expats, the local housing is a real mixture. There are some timber homes that look like a stiff sea breeze would knock them over. While right next door you might find a brightly painted concrete bungalow, with an impeccably manicured garden. Having driven around Ambergris Caye, admittedly for only a few hours, we couldn’t help but wonder what effect climate change will have. These Islands have a very low elevation, being developed over coral reefs. (The highest obstacle our golf cart had to negotiate were the speed humps) They are predominantly sand and at high tide the water laps to within metres of the houses – even those on stilts. Our drive was cut short, due to a storm front that was threatening. We had spent as much time as was needed touring Ambergris Caye but didn’t take many snaps. It just wasn’t that photogenic. There is apparently a Mayan ruin south of where were staying but we couldn’t find it. We were up very early on our last morning for our flight to Los Angeles. It had been raining, on and off, for a couple of days and light in the early morning sky was very dramatic. Guatemala, rich in pre and post-Columbian culture. Again we flew with Copa Airlines, this time from Managua to Guatemala City. As a bonus we were upgraded to Business Class. It’s a pity it was only a 55 minute flight. Even for that small time it’s good to feel more important than you are. We then rented another car, this time a Toyota Yaris, and drove straight to Antigua. We had been told that Guatemala City is only worth passing through, so we did just that. It took time to get out of the city but even longer to get over the mountains. It seemed to be a main truck route and we got caught behind countless slow moving, underpowered and overloaded lorries. We checked into the Hotel Convento Santa Catalina which was built in 1613. As the name suggests it was formally a convent and school. Our room had a rather large wooden cross on the wall to prove it. The hotel is beside the Santa Catalina Arch, which was used by the cloistered nuns to cross from the convent to the school without being seen. This is one of the most photographed sites in the city. Antigua was originally the capital of Guatemala and the first Capital of Central America. That’s until the earthquake of 1773, when most of the city was destroyed. It was rebuilt and is now the tourist capital of the country. Full of beautiful old colonial buildings and cobblestone streets, it’s regarded as a gem within Central America. It was given UNESCO World Heritage status in 1979. As much as there are renovated buildings in Antigua,there are ruins, again a result of the earthquake. The most spectacular is the San Josè Cathedral. The original church of Guatemala, built in 1680, it has three enormous domes and a labyrinth of catacombs. As we found in Mérida, Mexico, the indigenous population add another rich cultural layer to the local Hispanics. The women and girls still wear traditional clothes and sell their handicrafts on the streets. There are no stalls, they just squat down on the pavement and the tourists and locals mill around them. A thunderstorm hit on our first afternoon. No one seemed perturbed and just waited for it to blow over. The next day we decided to walk to the lookout at Cerro de La Cruz. This is a hilltop overlooking the city. It gives you a wonderful perspective of the classic colonial city layout. It’s much like Melbourne and built on a grid system. However the grid in Antigua is perfectly aligned on a north, south axis. The Casa Santo Domingo is a museum, of pre and post Columbian art and artifacts, plus contemporary art, all set within an archeological area, adjacent to a five star hotel. I was initially reluctant to visit ‘yet another museum’ but Thea talked me into it. What started out as a simple ethnological display turned out to be an ever unfolding trip though ancient and modern Guatemalan history. This was all housed in what was the church and convent of Santo Domingo and the Santo Tomás de Aquino College. Much of the church and convent were destroyed in the 1773 earthquake. This Museum Promenade, or cultural route, has renovated the ruins to house their exhibits. We continued our walk to the San Francisco Church and ruins. There was an almost festival feel in the church grounds, with many families filing in and out of the church and others having picnics in the back of their utes. There was one, rather corpulent, friar sitting under a tree and blessing the children of passing families with his bucket and brush. There were food and souvenir stalls lining the church yard. The next day we went to the last church on our list, La Merced. Again it had a festival feel. There were girls dressed in white, for their first communion, others taking communion and many more just hanging around the entrance, chatting to friends or having their photos taken. Outside was more like a fairground with hawkers and stalls selling everything from hand crafts to the off cuts of the ‘Host’ wafers. It was a special day for ‘mans best friend’ and there were dogs of all shapes and sizes all over Antigua. The dog food brand Purina seemed to be the sponsor. There were water stations set up to keep Fido hydrated. There were also Purina branded bibs on many of the dogs. We even saw one poor pooch served Coke in its bowl. Lunch is the main meal of the day in Latin America and the restaurants in Antigua were full. Many brought their dogs along for the treat, with lots of scraps being dropped under the table. The dogs would have slept well that Sunday night. Apart from the one who had the Coke that is. It’s only 76km from Antigua to Panajachel but it was one of the longest drives of my life. It took us just under three and a half hours. Leaving the relative calm of Antigua we joined Highway 14 and suddenly encountered a nose to tail line of trucks entering Chimaltenango. This continued for what seemed an eternity. Then we hit the Pan American Highway and I thought that the worst was over. Our route took us from four lanes to one as we passed over the mountains. There were potholes, landslides and a river to forge before we reached Panajachel. The river crossing was both scary and amusing. As we rounded a bend the road suddenly ended – there was nothing but a ravine in front of us. We backed up and took what appeared to be the road, now a dirt track, down a steep incline. At the bottom was a rather quickly flowing river. A road gang, working on replacing the bridge that had been washed away, assured us it was safe to pass. Also other vehicles seemed to be coming and going, so this was obviously the way. We then, very cautiously, crossed the river. We were in a Toyota Yaris not a Landcruiser, so I had visions if us being washed down stream. When we reached the other side there seemed to be no obvious way to rejoin the main road. Again more locals ushered us in the right direction, gabbling in Spanish and madly gesticulating. Getting to our hotel in Panajachel wasn’t as dramatic but it still took ages. Most of these small towns have a one way road system which are not, as I have experienced, clearly marked. We therefore had to circle around until we approached the street from the right direction. After three and a half hours it was a great relief to reach our hotel and find that we could park in front of our room. It was now late in the day and we went for a short walk down to Lake Atitlán. It had been a harrowing drive and a cool beverage was needed. It then started to pour, as a thunderstorm rolled in over the lake. From our vantage point at the bar the sound and light show was spectacular. Lake Atitlán was the reason we had come to Panajachel. It’s a large freshwater lake with jagged peaks, like the Atitlán and Jolimán volcanoes, plunging into the water. Atitlán is an ancient caldera formed only 85,000 years ago, which makes it quiet young. It is regarded by the tourist authorities and guide books as one of the most beautiful lakes in the world. The 130 square kilometre lake is fed by the three rivers, a waterfall, springs, rainfall and watershed from the surrounding mountains. The Reserva Natural Atitlán is on the lakeside and was once the finest coffee plantations in Guatemala. The bushes have now all but gone and the forest has grown back. There are a number of walks you can take. One to the lake and another through the forest to a waterfall. We took both but unfortunately didn’t finish the forest walk as we could hear another thunderstorm approaching. The reserve was well designed with tracks, linked by swing bridges. There was also a butterfly enclosure, teeming with life. We even got to see some more spider monkeys. These are amazing primates that have long limbs and an even longer, prehensile tail that’s used as a fifth limb. As seems to be the trend, there was also Zip Lining. We could hear the screech of the cable and hoots from the riders as they passed through the forrest above us. Built in 1948, Casa Cakchiquel was one of the first hotels on the lake. 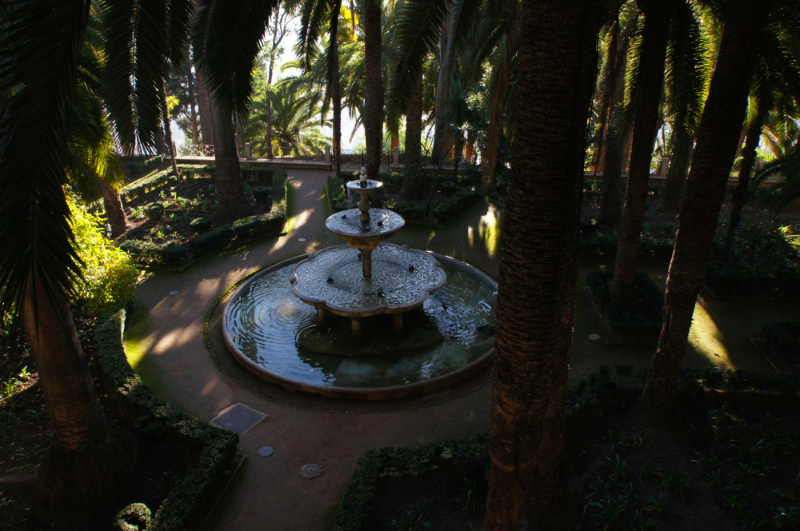 It was visited by the likes of Ernersto “Che” Guevara and Ingrid Bergman. There is a small photo gallery showing Guatemalan life from the turn of last century. 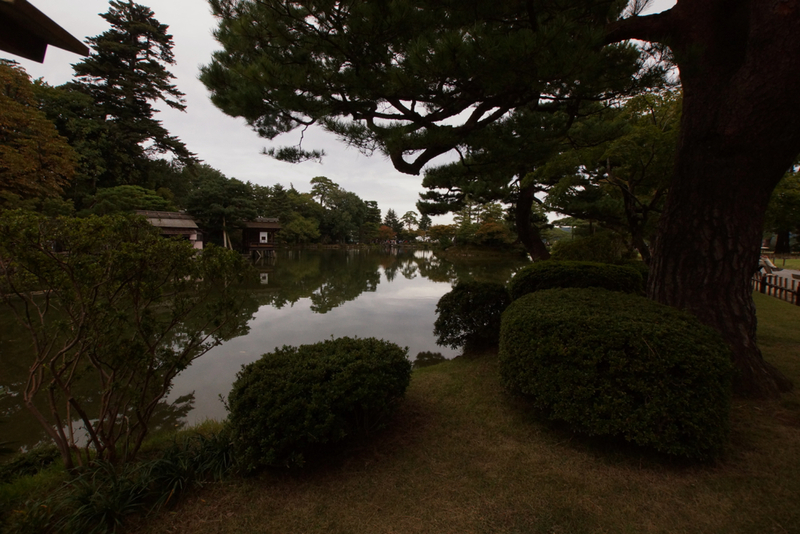 It’s also home to Restaurante Hana, serving traditional Japanese food. We decided that Japanese would be a good change from the local fare and Classic Italian, that seems to have become the ‘World Food’ of choice in most tourist destinations. No matter where you travel pizza and pasta is much easier to find, than local food, in most cities. Japanese and Koreans seem to have a liking for Panajachel and have started businesses there. The best coffee, that we found in Panajachel, was at Cafe Loco and it was run by Koreans. The young barista was taking it all very seriously. When we were there he was experimenting with a cold filtered coffee, that took twelve hours to prepare. The trip to Chichicastenango was less than 50km. With a small diversion to San Catarina Palopó, more heavy traffic and endless mountain villages to negotiate, it took us over two hours. Our hotel was the Museo Mayan, a quaint and eclectic establishment that was built in 1932 by Alfred S Clark (1893-1937). Alfred was a pioneer of tourism to Guatemala but had a problem with where to accommodate his tour groups. He saw the potential to bring Westerners to Chichicastenango and its unique cultural experience. He was so successful that within two years of building the Mayan Inn he had to build an extension. The only available WiFi in the hotel was near the front desk and it was there that we met José. He supposedly spoke five languages, had been a guide for over forty years and was there to help us get the most out of Chichicastenango, meaning ‘Place of the Nettles’. The locals call it Chichi, which is much easier to say. José was hard to resist. He showed us through the two main churches, Calvario del Sr. Sepuitado and Santo Thomás. They sit at either end of the Central market square. The market is the main attraction of Chichi but the churches are a revelation. Here both Catholicism and Mayan rituals exist side by side. There seems to be a strange blend of both faiths. San Thomás Church, which is 400 years old, was built over the ruins of a Mayan temple. The difference here is that the Mayans disregard the church and still go there to carry out their religious activities and rituals. Fires and the smell of incense permeates the Chichi air. The same happens in the cemetery. Here tombs are painted in different colours, according to the day of the week that the first person who is buried there died. They are gaudy shades of blues, greens, mauves, oranges, yellows and reds. In the midst of the graveyard are Mayan sacrificial fires, where offerings are made to help the deceased in the afterlife. Below the graveyard is a Mayan temple, built at the end of 26,000 years on the Mayan calendar, which was in 2012. The mask and costume maker, Miguel Ignacio, is an important part of the Chichi community. Here they make the masks and costumes for the Festival of Santo Thomas, which is held in late December. Inside they had a shrine for San Simón, the god of cigarettes and booze. We had a brief walk through the market area and preparation was in full swing for next day’s activities. Markets are held on Thursdays and Sundays. Next to the Central Square is a large mural depicting Mayan life, which runs along the walls of the Regional Museum. The next day was market day and we had a quick walk around before breakfast. Jose had told us to go to the church early, where the flowers sellers display their blooms on the steps, before the sun gets too hot. This is an excellent and colourful market with a huge variety of merchandise on offer. It’s all laid out in areas that seems to radiate out from the small square that lies between the two churches. There’s handicrafts, clothing, fruit, vegetables, meat and livestock. There was quiet a kerfuffle in the livestock area when a rather large sow escaped. As we walked around there was the gentle sound of clapping. We soon discovered that it was the local ladies making tortillas. Three or four would gather around a hot plate and pat the dough until it became flat enough to bake. The Guatemalans, especially the Mayan women are minute and I was continually feeling a rush of air under my elbow as another Indian rushed past. The Regional Museum has a small display of Pre-Hispanic artefacts, which was nothing to get excited about. It did however explain the importance of the Highland region to Guatemala, both in terms of Mayan culture and the provision of fresh produce. When we went out for dinner on the Thursday night most of the market had been dismantled. A bi-product of the Chichicastenango Market is a very healthy pack of stray dogs. At the end of market day they were eagerly devouring a large pile of scraps and leftovers before they were removed. We drove from Chichicastenango to Guatemala City Airport, where we dropped off the Yaris. We gave ourselves plenty of time, knowing the slowness of traffic in Guatemala. We needed most of it. Apart from the inevitable time spent in traffic, it took over an hour to check in the rental car. They go over the vehicle with a magnifying glass, trying to find the slightest blemish in the body work, that wasn’t there before. This is a scam to try and get you to pay for repairing the car. I usually take my own photos and that tends to put them off. Late in the day we flew 300km north from Guatemala City to Flores, an island town on Lago Petén Itzá. A causeway connects the Island to the twin towns Santa Elena and San Benito. In Pre-Columbian times Flores was the Mayan city of Nojpetén. We were in Flores primarily to tour to the ancient Mayan city of Tikal, which is about 63km away. Our bus had a mixture of Spanish and English speakers. Our English guide was Manuel, a very sprightly Guatemalan, who seemed to possess amazing reserves of energy. We walked for fours hours around Tikal, much of it through the tropical rainforest. Manuel would stride ahead leaving the younger members of the group behind. At our first Mayan Pyramid he bounded up the stairs, demonstrating the best way to climb. Then he virtually ran down, again showing us the way to descend. Tikal was designated a UNESCO World Heritage Site in 1979. The Mayans chose the area because of the abundance of limestone, their primary building material. 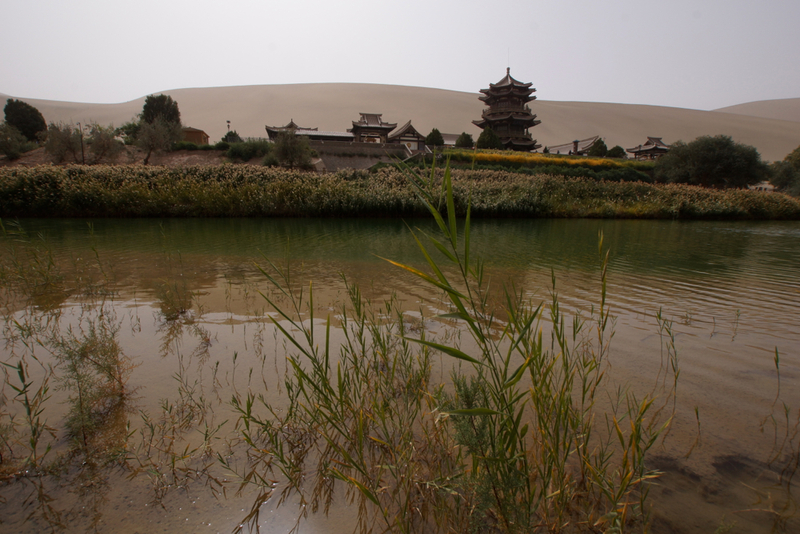 The area was gradually deforested as roads, temples, public buildings, housing and crops covered the landscape. The clearing of the jungle caused a drastic climate change, culminating in a severe drought that left the city, of over 100,000 inhabitants, without any water. Because there was no natural source of water, the Mayans built a series of reservoirs. These were fed by rainwater that was abundant when there was nothing but rainforest, but sadly lacking when there was none. The main part of Tikal covers about 16 square kilometres and includes around 4,000 structures. At its zenith it covered a much lager area than this. Very few of the original buildings are visible. 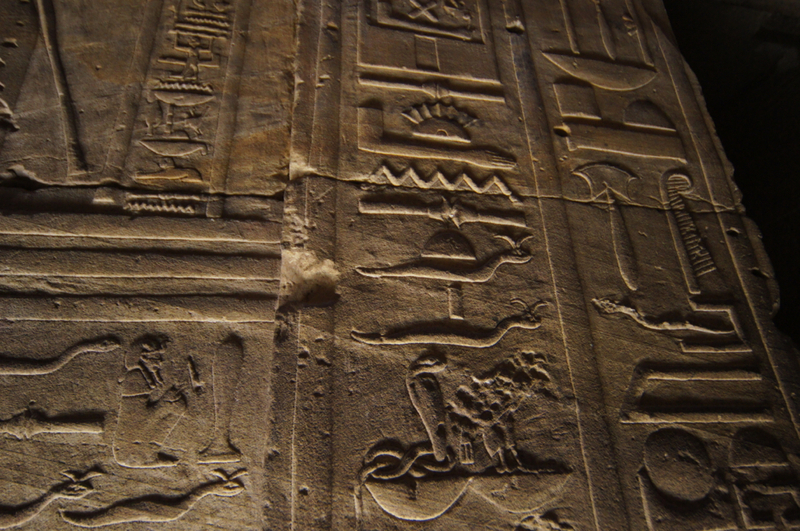 It was primarily built during the Early Classic Period, 4th to 6th centuries AD, but started in 750 BC. There was an alliance between Tikal and Teotihuacan, near Mexico City, making the twin cities the most powerful in Mesoamerica. Tikal’s power fluctuated, reaching its zenith in the early 8th century but it then went into decline. By the year 1,000 it was abandoned and not rediscovered again, and publicly recognised, until 1848. During that time the jungle repossessed the land and now the vast majority of the buildings are just mounds of vegetation. Nicaragua, right on the Pacific Ring or Fire. After two short flights from Manuel Antonio, one in a 12 seater Cessna, we reached Managua, the capital of Nicaragua. Nicaragua is the largest of the Central American countries with a relatively small population. I think they all live in Managua. It also has two of the largest fresh water lakes in Central America, predictably named, Lake Managua and Lake Nicaragua. The tropical weather had set in and it was 35°C with high humidity. Managua is divided into two distinct districts, the old part, which is north of the small volcanic lake, Laguna de Tiscapa, and the new part which is to the south. It’s a sprawling city and we didn’t feel like trying to navigate around it in the heat. So we hired a driver, come guide, to show us the highlights. Eyner showed us the best of the old and new parts. Managua suffered a devastating earthquake in 1972 that destroyed 90% of the downtown city area and killed over 19,000 people. One of the buildings to suffer the most damage was the Catedral de Santiago. At the time it was deemed impossible to rebuild and at present just the shell remains. It was designed by Pablo Dambach in 1920, then built and shipped from Belgium. There is now talk of repairing it. The new Cathedral of the Conception, that was completed in 1993 and replaced the ruined one, is a contemporary reinforced concrete construction, that really lacks the charm of the original church. The locals believe it looks like a crate of eggs from the outside. This is due to the multitude of domes on the roof. On the same square as the old cathedral is the National Palace, built in 1935, it currently houses the museum and library. Like much of Central America, Nicaragua has had its share of heroes, violence and corruption. He was a hero to the Nicaraguans and branded a bandit by the US. He was assassinated in 1934. A fascinating part of the rejuvenated city is the old port area on Lake Managua. This has been turned into a restaurant and picnic area. Unfortunately there are no water sport activities as the lake is heavily polluted. A rather bizarre addition to the street-scape are the giant, yellow, illuminated trees. These apparently are the brainchild of Rosario Murillo, wife of the president, Daniel Ortega. Inspired by Gustav Klimt, these symbolise the Tree of Life and are all over the city. The locals believe that the money could have been better spent. Our final stop on our Managua city tour was the food and craft market. As Eyner pointed out, this market is the only one that’s safe enough for tourists. We chose to stay at the more business oriented Holiday Inn Express. This was for a reason. One of our credit cards had been compromised and shut down so we had a new one sent by DHL courier to Managua. We felt a business hotel would know how to handle a delivery. They did and the new card was waiting for us when we arrived. Because of the layout of the city there is no real tourist oriented hub where there are hotels with restaurants near by. As it turned out our hotel selection was a good one, as the Galerías Santo Domingo was just up the road. This is a shopping mall with a large and varied restaurant area in an enclosed courtyard. The Holiday Inn even provided an hourly shuttle bus to the mall. It’s a great solution for a city with a new growth area, that doesn’t have a traditional restaurant scene. We returned to the Galerías Santo Domingo on our second night and the place was alive. There was even a band playing in a central courtyard. The mall still had the ubiquitous fast food court, but this restaurant area was set apart and much more up-market. A similar idea could breathe life into Southland and Chadstone malls that are traditionally lacking style, substance and good food. We hired a car in Managua and drove the 80km to Leon. It was an easy drive in a rather abused Nissan Tilda. The roads were mainly concrete and the surrounding country was more dry scrub than tropical. Navigating is made much easier using the off-line features in Google Maps and Triposo. Leon is one of the former capitals of Nicaragua, the other being Granada. There was squabbling between the the two cities until Managua became a geographic and political compromise. Leon was also the ecclesiastical centre and there is practically a church on every corner to prove it. It’s a colonial city, the heart of which is Parque Central. There are many grand buildings, some in need of restoration and others already being restored. The Cathedral is one that’s under renovation so the facade was a mess of scaffolding. However the interior was still open and very impressive. The current church was built in 1747 in an American-Baroque style. The Stations of the Cross are vast murals, considered masterpieces in Central America, painted by Antonio Sarria. On our first full day we went for a drive, firstly to the coast near Poneloya and Las Penitas then north to Chinandega. The day was very hazy and not great for snaps. We did drive on part of the Volcanic Route that took us past San Jacinto, Telica, Castila, San Cristobal and Chonco Volcanoes. Both Telica and San Cristobal are still active. Part of the road north from Chinandega is under repair, and for very good reason. The pot holes, I did’t manage to avoid, did nothing to improve the performance of the aging Nissan. Once we were back in Leon we had our first encounter with the law. Leon is full of one way streets, that aren’t always marked as such. I stupidly followed one of the tricycle taxis (Tuc-Tuc) and found myself going against the traffic. Obviously it was ok for him but not for me. I turned around and went back, only to be confronted by a sour faced traffic policeman. I acted dumb, not hard to do, and tried to explain that there were no signs. He wanted to see my license, so I gave him my International one, even though it was out of date. I figured that if he wanted to use it as leverage, I still had my Victorian one. Once he realised we were Australian he loosened up, gave me back my license and we were sent on our way, with instructions on how to find our hotel. Our last day in Leon was a Sunday and coincidently Mother’s Day in Australia. We had a leisurely lunch near Parque Central and then wandered around the city centre. The days are getting hotter and more humid – the rains are on the way. The eruption of the nearby Telica Volcano was a reminder that this whole area is sitting on what’s called the Pacific Ring of Fire. Driving from Leon to the outskirts of Granada was a breeze, then we encountered the one way streets again. At many intersections there are no signs indicating that the street ahead is one way. I again found myself going the wrong way. We eventually found the Hotel Dario and the bell boy jumped in the car and showed us how to get to the car park. This turned out to be just a street behind the hotel. The Hotel Dario is a charming colonial building, right in the centre of the walking street and surrounded by bars and restaurants. It has an open court yard and wide breezy verandas. Opposite the hotel was O’Shea’s Irish Pub. I am not usually one to visit Irish pubs, except in Ireland. This was different – they served craft beer on tap. I had a couple of glasses of Moropotente’s, 19 Días and it was very good. I returned the next night to make sure that the 19 Días wasn’t an aberration, and ran into the owner, Tom O’Shea. I questioned him about the brewer and the brew. Granada is very different to the far lest developed and more modest Leon. To start with it’s a UNESCO World Heritage Site. More of the buildings had been renovated and there was a greater tourist infrastructure in place. This also means that everything is more expensive. It was late in the day when we checked into the hotel and the afternoon thunderstorms were threatening. We walked around the city centre and then down to the edge of Lake Nicaragua. This is more an inland sea than a lake. In the haze the other side was barely visible. Leon might have had a lot of churches but Granada wasn’t far behind. They were larger and in various states of repair. After a morning of sites we headed into the mountains to La Catarina, a small tourist village that has a wonderful lookout over Laguna de Apoyo. This is a volcanic crater lake with Granada just visible behind. It was cooler and less humid with lots of locals also looking to escape the heat of Granada. The next morning we took a tour of the isletas or islands near the coast of Lake Nicaragua. There are reportedly 365 tropical islands dotted around the lake, edge. We stopped to visit Castillo San Pablo, a fort built by the Spanish in 1784 to protect Granada from pirate raids. With 68% of Nicaraguans on the poverty line, life on the waterways is about survival. 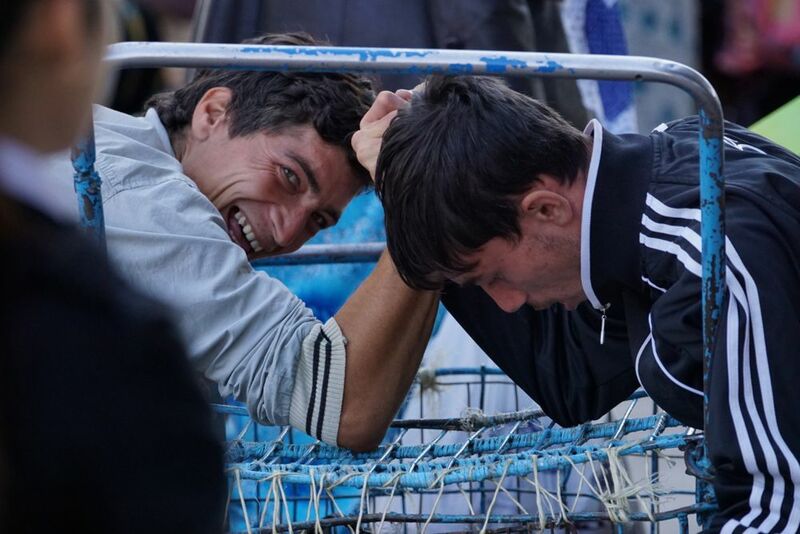 Fishing isn’t restricted so the locals fish to sell and feed their families. They live side by side with the rich Nicaraguans and foreigners who build luxury housing on their own private islands. The family who own Ron Flor du Caña, one of the worlds best rums, owns an island on the lake. 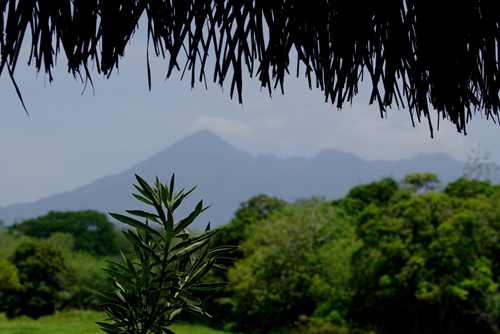 The Mombacho Volcano is a constant backdrop over Lake Nicaragua. In fact wherever you look there are the telltale silhouettes of volcanic peaks. Spider Monkeys were introduced as a tourist attraction to one of the small islands. Aptly named Isla de los Monos or Monkey Island. On the drive back from Granada to Managua we stopped off at the Masaya Volcano National Park. As we pulled into the car park we were greeted by the smell of sulphur, as it wafted out of the Santiago Crater. This is the most active volcano in Latin America and there are evacuation signs as we entered the park. I was particularly intrigued by the photo of a late model car with a rather large volcanic bolder imbedded in the bonnet. I wasn’t particularly fond of the Nissan but I couldn’t see it subjected to that grizzly fate. There’s even a warning to spend no more than five minutes at the crater’s edge, in case you are overcome by the fumes. However there are flocks of parakeets that nest inside the crater and manage to survive. We chose to do the rim walk around the extinct San Fernando Crater trail. This was a four kilometer, rocky, narrow and slippery track. Most of it running around the crater rim. The highlight, apart from the views was discovering a flock of resting vultures. These are truly ugly birds. Then in total contrast we came across a white frangipani in bloom. There were blossoming trees covering the crater floor. Costa Rica – pura vida. It’s only 250km from David, in Panama, to San José, in Costa Rica. Our aircraft was a twin engined prop that seemed to feel the bumps every centimeter of the way. The name of our hotel is about the worst play on words that I have ever encountered. The ‘Sleep Inn’, apart from its atrocious name, isn’t such a bad pub. It’s situated in the heart of San José and very close to the walking street of Avenida Central. Costa Rica is in the tropics and the rainy season is due to start, so every afternoon it rains. Stupidly we forgot to take our umbrellas when we first went out walking. 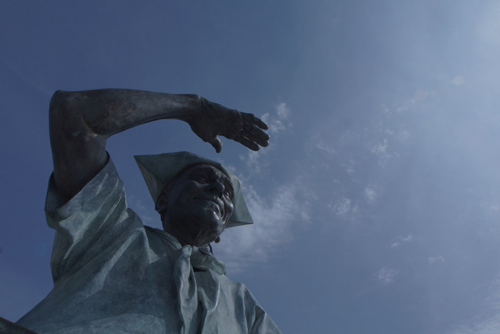 Europeans, in the form of Christopher Columbus, reached Costa Rica in 1502. In 1524, after, the indigenous people were conquered, Costa Rica was incorporated into the province of New Spain. It remained under Spanish influence for the next 300 years. With a total population of about 4.5 million, there are about 60,000 indigenous people in Costa Rica today. Antonio Saldaña, the last indigenous leader with any political authority, was assassinated in 1910. It’s a prosperous country, by Central American standards, and consistently performs well in the United Nations Human Development Index. This isn’t evident as you walk around San José as there seemed to be a lot of street people in the area near to our hotel. As over 25% of the population live in the capital, it’s probably to be expected. The next day we went out walking around San José, this time with our umbrellas. There is an abundance of street sculpture in the city and we encountered some of it on our walk. The Main Post office was an impressive building from the outside, with a very utilitarian interior. The Catedral Metropolitana was originally built in 1802 but was replaced in 1871, after an earthquake, with a design by Eusebio Rodríguez. The design of the new church combines Greek Orthodox, Neoclassical and Baroque styles. Inside the National Theatre or Teatro Nacional is the Alma du Café where we tried typical Costa Rican filtered coffee. You choose which blend you would like, from seven varieties, then it is served at the table with an individual filter for each cup. There was a free tour of the Teatro Nacional which gave us a good insight into this slice of Europe in the heart of San José. Architecturally it’s Neoclassical, part French, part Italian with touches of Masonic symbolism in the details. Construction started in 1891, and it was opened in 1897. The first performance was Johann Wolfgang von Goethe’s Faust. The building is used as a venue for state events. The sloping floor can be leveled, using winches, so important dinners and balls can be held. Receptions for US presidents JFK and Barak Obama have been held in the Teatro Nacional. While we were waiting for the tour of the theatre we did some people and pigeon watching in Plaza de la Cultura. The Museos del Banco Central is a bunker style building under the Plaza de la Cultura. Built in the 1970s, it’s shaped like an inverted triangle, with three underground levels. There in an excellent Anthropological exhibition, tracing the history and culture of the pre-Hispanic indigenous peoples of Costa Rica, from 500 BC to 1,500 AD. This is largely done through their highly developed craft of gold smithing. There was also a small exhibition of local contemporary art. Costa Rica’s main source of income isn’t coffee or bananas but Eco Tourism. They pride themselves on their sustainability in many areas, but it’s their nature sanctuaries and reserves that are their bread and butter. The expression “pura vida” or pure life is widely used by the Ticos, or Costa Ricans, as they are very proud of their political freedom, economy and environmental credentials. They have the largest number of foreign tourists of any Central American country. Side by side with the eco sites are the casinos. This is the seedier side of San José and there were a number around our hotel. In fact the Sleep Inn had its own casino right next door. We booked what was called a Combo Tour. This was a day tour to three locations, the Doka Coffee Plantation, Poás Volcano and the Lapaz Waterfall Gardens. Max was our guide and he kept us on a very short leash. The 112 year old Doka Coffee Plantation is 10,000 acres in size and had a turnover of $40,000,00. A far cry from the tiny Finca Dos Jefes Finca, in Boquete, Panama, that had 7 acres and needed the coffee tours to make money. Doka, surprisingly, wasn’t organic, they were about making money and everything was on a grand scale. The coffee at Dos Jefes Finca was much better. The drive to the Poás Volcano was through a very fertile region with strawberry farms lining the roadside. We walked to the volcano and were very lucky, as the clouds cleared and we could easily see the caldera and the lake inside the crater. There were clouds of steam erupting from the centre. Poás is an active volcano that is 2,708 meters high and has erupted 39 times since 1828. It’s last major eruption was in 2009 when it was near the epicenter of a 6.1 magnitude earthquake that killed at least forty people. 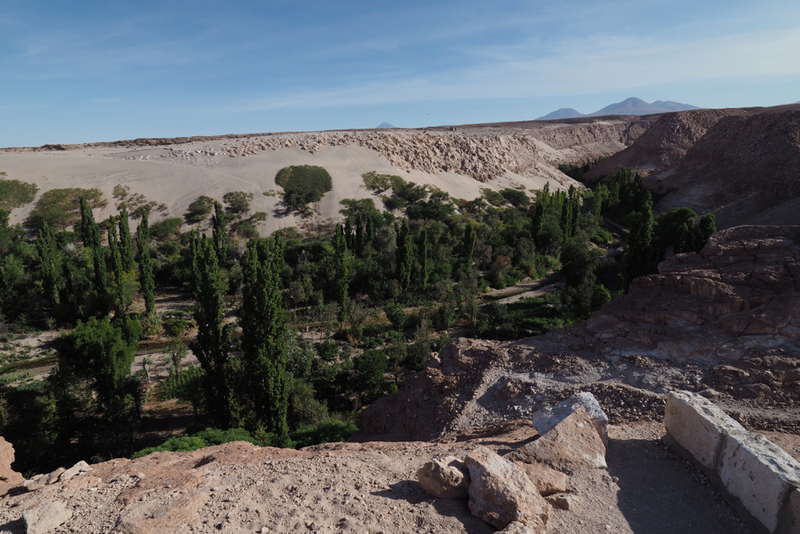 We then walked for a further twenty minutes to Lake Botos which fills an inactive crater that last erupted in 7500 BC. The entire area is surrounded by a cloud forest located within the Poás Volcano National Park. Our last stop was the Lapaz Waterfall Gardens. This has over 28.327 Hectares of rain and cloud forests, waterfalls and wildlife. There are humming birds, butterflies, reptiles, monkeys and jungle cats. It’s a bit Disney World but very well done and impeccably maintained. We took the shuttle bus from San José to Manuel Antonio. Part way through our drive we stopped on a bridge overlooking the Rio Grande de Tácoles. There, sunning themselves on the muddy bank, were a group of rather large alligators. This portion of our Costa Rican stay was as much about some R&R as it was about sightseeing. So after finding an ATM, which involved a bus ride back to Quepos (there were none in Manuel Antonio) we had a walk on the local beach. Then we had a drink at one of the beachside bars. As we were sipping our beverage there was a large bang on the roof. Another dint in the corrugated iron, as a coconut plummeted from a nearby palm. Australians, especially those who live near the beach, don’t really understand how lucky they are. This was a dark sand beach that in places almost turned to mud. The Pacific surf was pounding and the water was tepid but everyone, including us, had dirty feet. This beach is regarded as one of the gems of the Costa Rican Pacific coast. Very few beaches that we have visited have fine, golden sand. We were staying at the aptly named Jungle Beach Hotel, which was sitting in the jungle and overlooking the beach. It’s claim to fame are the monkeys that apparently visit the hotel at breakfast time and in the evening. In our first 24 hours the only fury animal we sited was the hotel’s pet rabbit. There were huge swells during our stay, caused by storms off the New Zealand coast. The locals must have been tearing their hair out, as the beach was virtually closed, in fact it disappeared for a lot of the day. Surf board, sun lounge and umbrella rentals were at a standstill. This must have been doubly disappointing as we were there on a long weekend holiday and the place was packed. Only the seasoned surfers were out on the breaks as the waves were three to four meters high. I saw at least one broken board. We booked a guided tour to the Manuel Antonio National Park. Our hotel offered a tour that we thought was expensive – so we shopped around. We soon discovered that all the tours are the same price, there are just a lot of agents selling them. It was suggested in Lonely Planet that seeing the park with a guide guarantees you will see things. Our guide, Marvin, would suddenly stop, set up his telescope and say: “There’s a Two Toed Sloth up there” And sure enough, there it was. As hard as I could try, I could not see it until it was pointed out to me. He did the same thing with snakes, lizards, birds, monkeys and even spiders. He was continually seeing things we couldn’t. I know it was his job but he was very good at it. He was continually telling us stories about the wildlife. One we all liked related to the ‘pooping’ habits of sloths. Apparently they only come down from the trees once a week to poo. They can pass up to a third of their body weight and have to dislocate their coccyx in order to do it. This obviously makes them very vulnerable to predators. All the guides had high powered telescopes to view the birds, animals and insects in close-up. They could be very cleverly used with a smart phone. All they did was push the lens of the phone up against the eye piece of the telescope and then zoom in on the image to get rid of the edges of the eye piece. The telescope was equivalent to about a 500-600mm telephoto lens. The results were remarkably good. So much for all my expensive camera gear. The Manuel Antonio National Park is the smallest in Costa Rica, only 1983 hectares, but one of the most popular. The popularity not only comes from the flora and fauna, but the beaches that are in and near the park. It’s also a marine reserve with 55,000 hectares under protection. The nature walk with Marvin only covered about 1.5km but took three hours. We were constantly stopping and Marvin would conjure up an animal, seemingly out of thin air. The walk took us to the end of the promontory and from there we could wander around. We did so for another hour or so, but could never see what Marvin saw. It was hot and the humidity was high so we walked back to town for a cool drink. The tide was coming in and the waves were still large – but not a big as the previous days. One night we walked up the hill to the restaurant El Avion. The main claim to fame of El Avion is that the bar has been built inside a 1954 Fairchild C-123. The aircraft was reportedly purchased by the US government in the ’80s for the Nicaraguan Contras. It never made it out of its hangar and was eventually purchased by the owner of the restaurant. As well as the unique environment, the food was rather good. 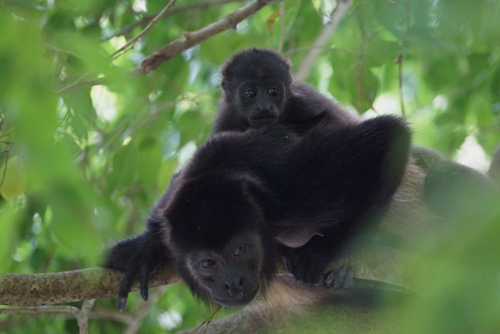 On our last night a group of Howler Monkeys passed by the hotel. We had now seen the monkey trifecta in Manuel Antonio. White Faced, Squirrel and now the Howler. They are called Howler Monkeys because of the sound they make. It’s similar to the screech of a Formula One engine – at full revs. Panama, more than just the canal. Our hotel in Panama City was pleasant enough but a little out of the way for our liking. It was neither in the new part nor the old part and we found that we had to do a lot of walking to get to the interesting places. Reading the Lonely Planet we decided that the Casco Viejo, which is the old part of the city was just too dangerous – this was far from the truth. We should have learnt from our experience staying in Raval, Barcelona. These older parts are where the best restaurants and the real soul of the city can be found. On our first day we found ourselves gravitating to Casco Viejo, where we found a lively rooftop bar that overlooked both the old and new parts of Panama City. The lift and printer in our hotel and the WiFi at a cafe at Multicentro Mall. Even on the Hop-On-Hop-Off-Bus, sometimes the PA system worked and sometimes it didn’t. There were two sections to the bus tour, the canal tour and then the original old city or Panamá Viejo tour. There is nothing in Panamá Viejo but ruins, as it was reduced to rubble by the pirate Henry Morgan in 1671. We walked around the newest part of the city, an area full of high rise apartments, office blocks and luxury hotels. It was here that we discovered the Hard Rock Hotel. Now call me uneducated but I have never set foot inside a Hard Rock Cafe, let alone a Hard Rock Hotel. The foyer was a cross between a rock venue, a casino and a pop culture museum. There were instruments, photos and wardrobe belonging to famous rock stars from the past and present. We looked to see what the price of a room is at the Panama City Hard Rock Hotel and were shocked. These rock aficionados must be rolling in it. If the number of German luxury sedans are anything to go by, then Panama has more wealth than we have seen so far in the Caribbean, Mexico and Central America. We have also seen more people exercising and more sports stores. If another sign of wealth is self esteem, then Panama City is doing well. 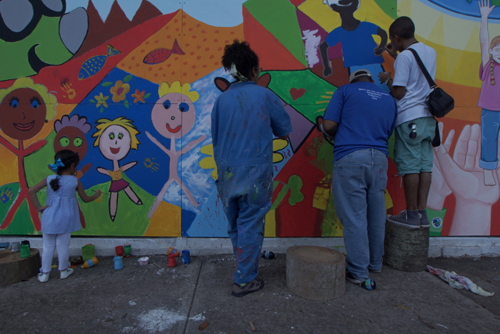 On Avenue Balboa we even discovered a community art project, which was a Mural for autism awareness. When communities can spend time and money on the needs of others, then there is a quality of life beyond survival. Panama is all about ‘The Canal’ and no visit would be complete without a canal tour. Our trip, on the Pacific Queen, started with a traffic jam and we nearly didn’t make it. We asked reception at the hotel how long it would take to get to Isla Flamenco, where our boat was departing from. Fifteen minutes, was his confident reply. It took nearly 45 minutes, with Thea texting the tour organiser telling them we were on our way. Apparently it takes that long every day. Coming out of Panama City we passed two bridges, the first being the Bridge of the Americas, completed in 1962 and then the Centennial Bridge which is much newer, being completed in 2004. The canal celebrated it’s centenary in 2014. It was built by the US, starting in 1904 and completed in 1914. Before the US the French attempted to build a canal in 1881. This failed due to engineering difficulties and the high mortality rate through tropical diseases. The canal is 48 miles in length (77.1 km) and raises the ships by 85 feet (25.9 Meters) at each side of Lake Gatun. This is an artificial lake that provides water for the locks. The sea level is the same on both the Atlantic and Pacific sides. The reason for the locks is to cope with the tidal variations. All the locks are gravity fed, there are no pumps. It only takes a relatively short time for 26,000,000 gallons to move from one lock to another. In the morning large vessels travel northward, from the Pacific towards the Atlantic. They cross at Lake Gatun, where vessels that are coming from the Atlantic, pass to the Pacific in the afternoon. Currently the canal can only take Panamax Class vessels. These are just smaller than the size of the locks – 110ft (33.528 Meters) wide and 1050ft (320.04 Meters) long, and 41ft (12.4968 Meters) deep. There is a Panama Canal extension underway that will allow Mega Ships to pass through. It is estimated that this will double the income generated by the canal. The canal charges each vessel according to their size, so these larger ships will be able to generate greater income. We were accompanied through the locks by a number of smaller vessels. One was first owned by J P Morgan, the American financier and then later acquired by the gangster Alfonse Capone. I wonder how many of Big Al’s ‘colleagues’ ended up overboard. After six and a quarter hours on the Pacific Queen we docked at Gamboa, on Lake Gatum. We were then bused back to Isla Flamenco which only took 45 minutes. The Panama Canal is not the fastest way to cross the Continental Divide, however it’s a lot faster than sailing around Cape Horn. And I guess that was the point. On Saturday we took a final walk into the old city – now we couldn’t stay away. The waterfront isn’t that attractive when the tide’s out, with tidal mud flats, partly sunken boats and garbage. We attempted to do the walking tour around Casco Viejo, that was suggested in the Hop-On-Hop-Off Bus brochure. We did do it, but in reverse. It was our last day and we had to get an early flight the following morning. Rather than do the walk and then eat, we did it the other way around. We chose a restaurant that was near the end of the walk, so that’s where we started. Casco Viejo is undergoing a major renovation. It was originally the top end of town then fell into a decline. It’s now starting to regain its former glory. Its here that the new city was established after Henry Morgan destroyed Panamá Viejo. We met a friend from Australia who has just started a three months project in Panama. He is in the brewing industry and introduced us to La Rana Dorada. This is a Boutique Brewer who are making some rather nice beers. Now the beauty of slow travel is that you have the time to re visit favourite spots. La Rana Dorada definitely deserved a repeat visit. We had another pleasant flight with Copa Airlines from Panama City to David, then hired a car and drove north to Boquete. This is a mountain area close to the Costa Rican border and known as the Valley of the Flowers. The soil is rich and fertile with acres of flowers, fruit and coffee. We had come for the coffee, as Boquete is regarded by many as the Nappa Valley of coffee and we planned to do a plantation tour. It’s also home to a large expat community and the town has two distinctly different socioeconomic areas. After we arrived we spent the afternoon driving around the surrounding hills. There are a number of loop roads that leave the town and then, inevitably, return. As we were told It’s hard to get lost around Boquete. The area has a decidedly non Panamanian feel about it. It’s more like the Swiss Alps in the tropics. The homes were large, many are timber with high pitched roofs and the pace was relaxed. Admittedly it was Sunday when we arrived, but I had a feeling that Boquete never really built up a sweat. Our experience at the Art Cafe on our first night was anything but inspiring. We arrived in Boquete in late in the morning and this cafe seemed like a good place for a coffee. The owner was a pleasant guy who showed us the menu and suggested that we return in the evening to have dinner. Not knowing if the town, or the restaurants, were running on American or Panamanian time (Americans eat early, while Panamanians eat late) we turned up for dinner at 7pm. Apart from one other diner, he was the only other customer than evening, the place was empty. At 7:40 ‘mine host’ wished us good night and drove away. Immediately the staff started to pack up around us and finally, just before eight, the chef left. We were still eating our main course, the restaurant was empty and the lights were out in the kitchen. Then a strange thing happened, new customers started to turn up looking for a meal. There were at least eight, many were locals and they all got turned away. The owner, unfortunately I can’t remember his name, told us that he hoped to be able to sell the Art Cafe in a couple of years, for a good profit, and move on. How sadly mistaken he is. Another aspect of his business that I didn’t particularly like was that he only accepted ‘cash’ transactions. As we have seen in many places, this is a sure sign that he isn’t paying tax. I am positive he would be the first to complain when the power went out or the roads needed repairing. The next day we went looking to see the Cráter de Volcán Barú and then walk in the jungle. We ended up having coffee. The view of the volcano was constantly shrouded in heavy cloud. Then whenever we got near a walking track those clouds morphed into heavy tropical rain. The drive was still spectacular with rich vegetation on all sides and steep, rocky escarpments rising out of the jungle. The weather improved for our final day in Boquete. We had booked a half day tour of a local coffee plantation. This was far less grand than the word ‘plantation’ indicates – it was more a hobby farm. Finca Dos Jefes or The Farm With Two Bosses is only 7 acres and owned by an expat American, Rich Lipner. They are verified organic and very proud of the Arabica blend which has a tasting valuation of 91. We were shown around the property by Gary Jackson, another American, and then given a rundown on how their coffee is grown, harvested, dried and blended. We were given an overview as to how it is tasted and what the tasters look for in a brew. It tasted like coffee to me. If was explained to us that all coffee originally came from Ethiopia, a bit like the human race, and has spread around the world from there. After roasting some coffee we then tasted two styles, one dark and the other a medium roast. These were served using a French Press, what we call a plunger. Gary did also mention that espresso coffee has less caffeine than filtered or plunger coffee. This is plausible, considering the amount of coffee you have in an espresso is far smaller that in a regular coffee. Added to that is the fact that Robusta beans, used to make filtered coffee, have more caffeine than Arabica beans, which are used for an espresso. The tour finished up with us all being offered a cold beer. Again this was good but I don’t understand why we were given a beer at a coffee tasting. Like the Art Caffe, on our first night, Finca Dos Jefes only accepted cash and no receipt was given. Boquete is also home to the world famous Geisha Coffee, which is the only coffee to have scored a perfect 100 from the international tasters. According to Gary, this coffee’s unique flavour comes from a combination of a perfect terroir and the jasmine bushes that were there before the Geisha Coffee trees were planted. In the afternoon we went for a six kilometre walk to the Escondida Waterfall in the Volcano Baru National Park. This is a beautiful rainforest area that has been unfortunately marred by the proliferation of water pipes, both steel and plastic, that remove mountain water from the waterfall and pipes it to the local farms and market gardens. The actual waterfall was disappointing but the walk was very pleasant. This area is also the home of the rare Quetzal, a strikingly coloured bird with red, green and gold plumage. We thought we saw one, but we definitely did see the sign saying they were in the area. Mexico City – take three. We returned to Mexico City in preparation for our flight to Panama. We felt that we had done the touristy things and just wanted to walk around and look for the unusual. Throughout the main part of the city are organ grinders, without a monkey. These are guys, and they are all men, dressed in a khaki uniform, who expect to be paid for winding a handle. Many have an assistant who holds out the organ grinder’s hat for donations. I guess they are in fact the monkey. 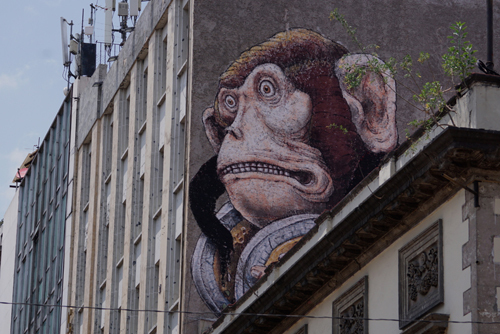 There are many murals painted on the city walls, one that took my fancy was funnily of a monkey. He was the only one we saw in Mexico City, apart from at the zoo that is. The Museo Nacional de Arte is housed in a beautiful neoclassical building in the historic centre of the city. It was completely renovated in 2000 and has a large collection of Mexican art from the mid-sixteen to mid-twentieth century. It was a Sunday and the museum was free, even for the Gringos. As we left there was a Beatles cover band playing all the classics. They were rather good and a large crowd gathered around. I wondered if any of the crowd had ever seen the Fab Four perform live. Another delightful building is Palacio Postal or Main Post Office. It was built at the beginning of last century and renovated in the 1990s following the earthquake of 1985. It’s a mixture of many styles and can best be described as eclectic. Casa de los Azulejos or House of Tiles is an18th century palace that was built by Count del Valle de Orizaba. It was taken over by the Sanborns brothers in1903 and is now their flagship restaurant. Shooting had obviously finished on the new Bond movie so the Zócalo was free of barricades. We wandered around late in the evening. The buildings were tastefully illuminated, showing off each of the building’s classic features. It’s no wonder that the Zócalo is regarded as one of the world’s most beautiful squares. We had dinner at La Opera, an old world restaurant with high ceilings, waiters in white coats and an aging Mariachi band that wanted $7 to perform three songs. Surprisingly they got a lot of gigs. Mexico City Zoo is the proud owner of a number of Giant Pandas having developed a successful breeding program since 1980. I am not a great fan of zoos and this one was reminiscent of the old style, with dingy enclosures and animals that look very much out of place. Chapultepec Castle was started in 1775 and has the honour of being the only royal castle in North America that has actually been used by a sovereign. The post Hispanic art of Mexico, that we have seen at both the Museo Nacional de Arte and Chapultepec Castle, appears to be more a record of history and story telling than decorative. The Renaissance art of 16 century Europe told stories but only with pictures whereas in Mexico art is more like a graphic novel, combining words, story telling and decorative art. Many of the painting and murals have an accompanying text. Some even have a legend with people and places. Our last night in Mexico started off as drinks but turned into dinner. This was at the Gran Hotel Ciudad de México, which had an excellent roof top bar and restaurant that overlooks the Zócalo. The building was originally the Mercantile Centre, built in 1899. It has a highly decorative Art Nouveau interior. It was a fitting end to our third stay in Mexico City. Copper Canyon, one of the world’s great train rides. We flew from La Paz Airport, which was small, to Los Mochis, which was even smaller. This was with AeroCalafia, on a twin engined prop aircraft. Having tried to self cater a Copper Canyon Railway tour and failing, we opted for a package trip. This was the first time we had done this since Iran. It felt strange, not having to plan ahead. We were picked up at the airport in Los Mochis and driven north to El Fuerte. The railway line appeared occasionally on our left and right, as did the Rio Fuerte. This area is much lusher than Baja, with trees, fields of corn and other agriculture. There were fewer cacti, of a different variety. The Organ Pipe Cactus, as the name suggests, are more slender and straighter. Eco Tourism is a growth industry worldwide. I am not sure what constitutes the eco side but if you paint your truck with zebra stripes or pictures of flora and fauna, then it seems to become an eco tour. We took an eco tour and drove upstream, along the Rio Fuerte and then launched a dingy into the river and floated down. After a while we went ashore and did a bird watching bush walk. Our guide kept on pointing out birds that I could never see. We then went to see the Nahauti petroglyphs, where there were some reasonable examples of rock carvings, reportedly 2,500 years old. These are from an early period of the Nahauti Indians and depict serpents, sun gods and shamans. At some point during the walk I got eaten alive by an undentifiable, small carnivoros insect. This was despite having applied liberal amounts of ‘Tropical Strength’ insect repellant. It was into the boat again and we floated back to El Fuerte. There was no outboard to power us, just the fast flowing river and the arms of our guide. That was the real eco part. El Fuerte was founded in 1563 by the Spanish conquistador Francisco de Ibarra. I wonder if he had a problem with black biting bugs? 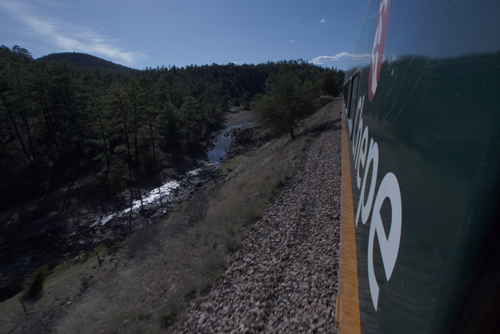 The following day was the real start of the Copper Canyon trip on El Chepe or Ferrocarril Barrancas de Cobre. We boarded the train just after 8am. The sun was still low in the sky but the temperature was warming up. Our first day’s journey was from El Fuerte to Bahuchivo Station. The carriages were old and a little worn, while the pace was slow. Even slower when there was a gradient. This was certainly not a Bullet Train. It was a spectacular ride, with lakes, rivers, tunnels, bridges and switchbacks. What made it more enjoyable was that we weren’t confined to viewing the scenery from our seats. We could go to where the carriages were coupled and take snaps from there. The top half of the carriage door was open so there was nothing stopping us leaning out to get a better shot and a face full of diesel fumes if we weren’t careful. There were only three carriages – the restaurant car, first class and then second class. The staff were all in traditional railroad uniforms and there was a heavily armed guard in the last carriage. However come dinner time, around 6pm, they all congregate in the dining car for a feed. An ideal time for the Bandidos to swoop on the Chepe. Mario picked us up from Bahuchivo Station and drove us to our accommodation at San Isidro Lodge, which was a few kilometres out of Cerocauhui. On the way he stopped to show us Yogi Bear Rock. It really does look like a more than average bear. That afternoon we drove up to the Urique Rim. This is high up overlooking the Copper Canyon. The views were breathtaking, with rocky escarpments on either side and the river snaking its way from left to right. 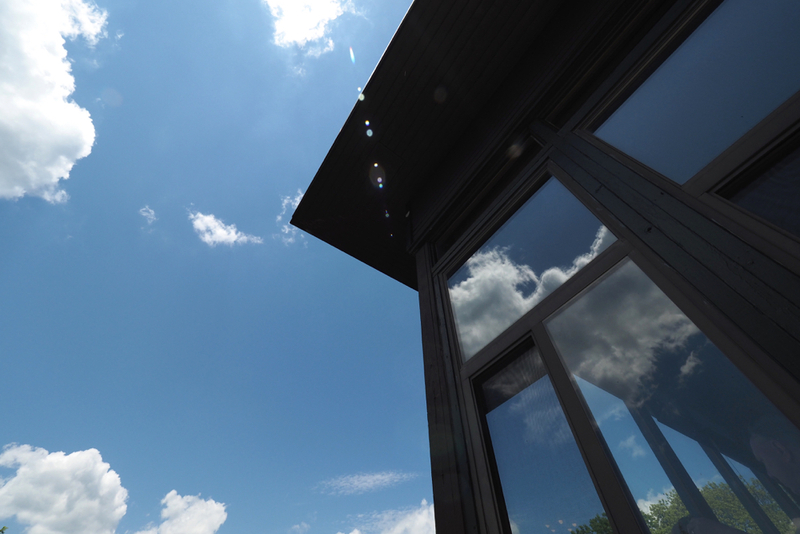 There is even a purpose built cantilevered lookout hanging over the valley floor. We then returned to San Isidro Lodge and walked to where there was another stunning valley view. We just sat and enjoyed the moment. The lodge is part of a working farm run by Mario and his three brothers and two sisters. There were dogs, horses and an array of barnyard birds and one poor parrot. This Polly had unfortunately had its wings clipped. I didn’t find that very eco. The next morning, before rejoining the train, we visited the tiny village of Cerocauhui, with just 1,800 inhabitants. Mario said that he knew all of the locals and they know him. He therefore had to behave. The area was fist visited by the Spaniards in 1679 and they immediately built a mission and church. The Saint Francis Xavier Church has undergone many restorations, the last being in 1940, but has maintained much of the original interior. Before the Spanish arrived to convert them, the Tarahumara Indians inhabited this area. We visited a local Catholic school that takes Indian girls in as boarders. Mario, who was himself part Indian, said there were many Tarahumaras living in the area and surrounding hills. They are very religious and seem to have been able to combine Catholicism with their traditional Indian culture. Much the same as the Mayans have done. This next stage of the Copper Canyon trip was from Bahuchivo Station to Posada Barrancas Station. The train was on time, which apparently is rare, and we were soon underway. The surrounding area was alpine forests and farmland, interspersed with small villages. The scenery wasn’t as dramatic as the previous day but it was still breathtaking. It was only a short trip with a rather long hold up waiting for a goods train to pass. The local Indian woman were very quick to seize the opportunity to sell their local handicrafts to the tourists. 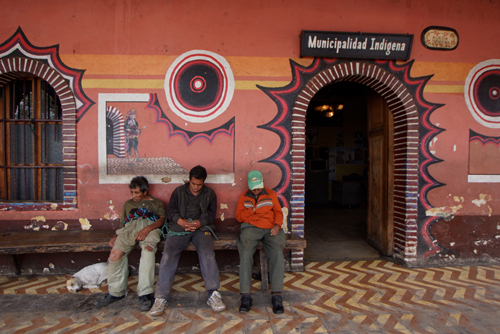 No sooner had we arrived at Posada Barrancas Station than we were into a van and off to our hotel. The Hotel Mansion Tarahumar ‘El Castillo’ is a rather large and sprawling, Disneyesque establishment that is managed, with an iron fist, by Maria Barriga. It was built by her brother, Jesus on 36 acres of steep hillside and was opened in 1993. It’s made up of seventy cabanas or cabins, some have red conical turret towers. The main dining area has a lofty timber ceiling with a huge open fire place. Jesus told the contractors that he wanted to build a first class hotel – a palace. As soon as we arrived we were urged to have lunch and then check into our rooms later. After lunch we were bundled into another van and taken on what seemed to be a very long ride up the hill. The main part of the hotel disappeared into the mist as we climbed ever higher. Then the road ended and we had to climb even higher still. By this time we were fearing the worst. When we finally got to our rooms we realised that we had been given the best, if not the most remote, rooms in the hotel. They were perched on the edge of the rim, overlooking the Copper Canyon. Later in the afternoon we went on a walk around the rim to a small mountain settlement that is home to a group of the local Tarahumar Indians. Apparently the hotel has a policy of promoting their culture and crafts. We didn’t buy but we did leave a donation. In the evening we sat on the balcony overlooking the town. The two bird feeders hanging there were constantly in use. Humming Birds and Woodpeckers were two species I recognised. We were spending two nights at the Hotel Mansion Tarahumar, so the next day didn’t involve any rail travel. The hotel had a tour that was included in our package, so we took that. There was a choice of Zip Riding or the more conventional funicular to cross the gorge. Now Zip Riding is like a flying fox on steroids. It’s a little less scary than Zip Lining but still involves great heights and high speed. You are harnessed into a seat, which is attached to a very taught cable, which is launched across a ravine. Afterwards we visited various viewing platforms, that look out across the canyon, ending up at Divisadero. This is a small village that sits next to the rail line. There are any number of opportunities to both buy and eat, as the train makes a fifteen minute shop here. Rather than take the bus back to the hotel we decided to walk. It was only meant to be 5km and the weather was cool but pleasant. We took a wrong turn and ended up at the funicular station. In a moment of rashness we decided that the Zip Riding looked like fun, and we should try it. We had to fill out an indemnity form, which didn’t help our apprehension. As it turns out this is the longest Zip Ride in the world, travelling over a distance of 2,530 metres and reaching speeds of 125 kph. The initial launch from the platform takes your breath away, as you plunge downwards at an ever increasing speed. It then it levels out and becomes quiet relaxing. The hardest part is the 700 metre climb back up to the funicular, which then takes you back to the start. After the exhilaration of the Zip Ride we continued our walk back to the hotel. We again took the wrong direction, making the walk even longer than the original 5km. The next day we took the final leg of our rail trip to Chihuahua. This was the longest stretch by far. I had a feeling that the best photo opportunities were behind us. That was until we discovered the back of the train. Most trains have a guards van that brings up the rear, not the Chepe. We found we could go right to the back, where it was again open and overlook the tracks receding into the distance. Our new vantage point in the vestibule was short lived as one of the staff booted us out. As it turned out we weren’t meant to be there after all. This section of the journey took us to our highest point at 2,460 metres. It was then downhill to Chihuahua. Leaving the canyons and the mountains behind, we passed through pockets of farmland with gentler slopes in either side. The more we descended the flatter the terrain became until we were finally travelling through acres of fallow wheat and corn fields. We waited for a goods train that lumbered past. It was going so slowly that a group of ‘Rail Riders’ were able to jump on board. It was dark by the time we reached Chihuahua – the end of line for our Copper Canyon adventure. Baja California Sur and the Hotel California. La Paz is in southern part of the of Baja California Peninsula. This is the second longest peninsula on earth, next to the Malay Peninsula, measuring 1,247km, from north to south with 4,000km of coastline. It starts at the US border, with the Pacific Ocean on the west coast and the Gulf of California, or Sea of Cortéz, on the east. The first day in La Paz was spent walking around the township. It was very quiet and most people seemed to be inside or eating at the many restaurants dotted along the Malecón. This seaside promenade is about 5km long with an array of aquatic themed sculptures. My favourite was of an old man in a paper boat, titled ‘El Viejo y el mar’ by Guillermo Gomez. Our hotel was the Mediterrane and again in a great location. From our balcony we had a wonderful view, over the Malecón to the beach and marina. There was a wedding in progress at Catedral de Nuestra Señora del Pilar de la Paz. Outside the church were the giant letters ‘A&J’. We can only assume that these were the couple’s initials. Come Saturday night and La Paz had livened up. The streets were crowded, but no where near as busy as the main boulevard, which was bumper to bumper with cruising cars and pick-up trucks. They were a diverse group, some with music blaring, through open windows, while others had their windows wound up tight, keeping cool in their air conditioned comfort. The food in La Paz was very cosmopolitan with a slight Mexican influence. The beers in Mérida and La Paz were outstanding. I awarded five stars to Patito Draught in Merida and Baja Blond in La Paz. We hired a car for a couple of days to get a feeling of the surrounding countryside. Our first trip was south on a Highway 1. El Triunfo was the first mining centre of the peninsula. Silver was mined there in 1751 and the town flourished. Once the minerals dried up these mountain towns lost their importance and were reduced to a Main Street and not much more. One legacy of the towns wealth is the Church of Nuestra Señora de Guadalupe de El Triunfo. The country was rugged with many large cacti shooting up from the parched earth. 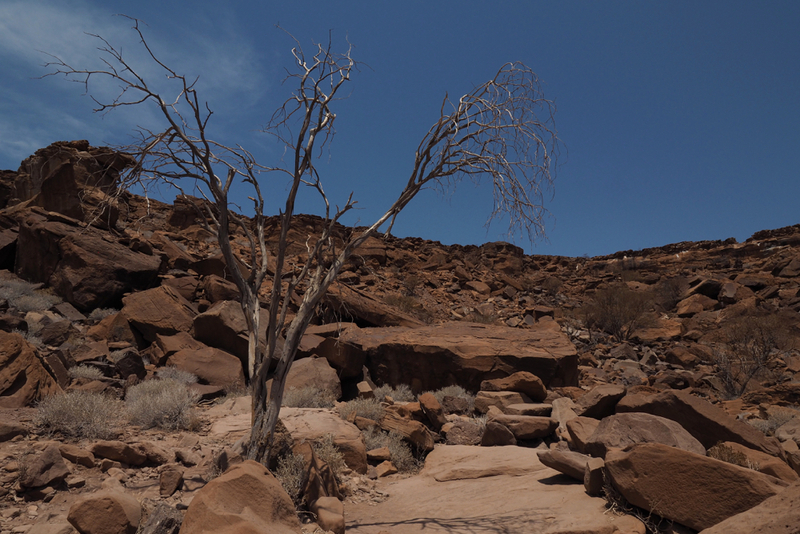 The valleys were scarred with wide, dry riverbeds strewn with boulders. After passing through the mountains we headed for the coast. The mountain road twisted and turned, then suddenly we were looking at the Sea of Cortez. 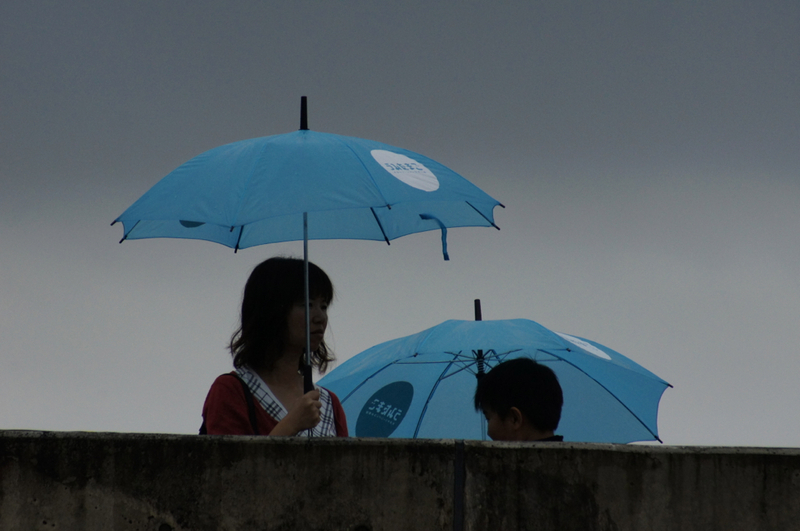 Due to the haze, it was only distinguishable as a slightly darker blue tone against the lighter blue sky. Most of the shoreline was occupied by private housing, that seems to go right to the water’s edge. We did find Buenvista, a resort town that had some sort of urban centre. I am sure that this coast is home to many small fishing villages. With all but the major roads being dirt, we weren’t willing to take the tiny Hyundai off-road. It’s no wonder the locals all have 4X4 pick-ups. Our second day with the car we again headed out of La Paz, this time to the south west and the Pacific Ocean. On Highway 16 is Todos Santos, which is close to the coast but not on it. It’s home to The Hotel California. Unfortunately this isn’t the hotel immortalised in the song by the Eagles. The song is just an allegory and there was no real hotel. However this doesn’t stop the management alluding to the fact that it’s the real McCoy. Game fishing is a big tourist attraction in Baja California Sur. It’s also dwindling, as every fish caught means less fish to catch. I was interested to read an article in the local English language, and aptly named, ‘Gringo Gazette’ about a unique idea to solve the problem. Rather than kill and stuff the catch, to become a trophy above some rich guys mantle piece, a plastic replica is made. As the article pointed out, who would really know the difference – apart from the fish that is. Just south of Todos Santos, at 23° 26′ 22″ N, is the Tropic of Cancer, it was here that we finally found the Pacific Ocean, at El Pescadero. It wasn’t that spectacular but it was the Pacific, and we hadn’t seen it for some time. Even this coastline is dominated by condominiums, hotels and private mansions. Again only reachable by dirt road. Fortunately the little Hyundai managed it with ease.